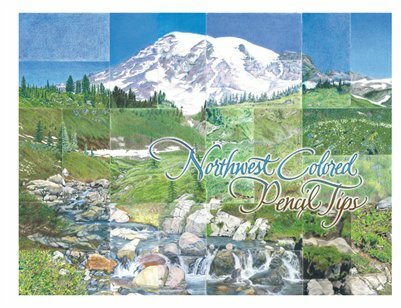 The Northwest Colored Pencil Tips book is packed with full color art and shared secrets from 55 colored pencil artists. A variety of surfaces are shown such as: drafting film, rock, plastic, Pastelbord, watercolor canvas board, white, black and colored surfaces. The book showcases 100% colored pencil art and colored pencil combined with watercolor, acrylic, ink, gouache, graphite and water-soluble pastels. Our artists share the use of their different tools (from embossing wheels to Magic Sponges) and techniques for creating personal treasures. Included are tips for addressing artist block, generating ideas, developing a personal style, and some step-by-step examples. These ninety pages are filled with information and inspiration!